David Wright will never be the same. By that I mean we won’t see the guy that was an All -Star as recently as 2013. The back condition known as spinal stenosis will see to that. In fact, he may struggle to play 100 games as season from now until the day he retires. However, does that mean that the captain of the New York Mets will cease to be a productive player? One player Wright has been compared to quite often this Spring is former New York Yankees’ star Don Mattingly. Donnie Baseball had a similar issue (though not as pronounced) with his back that curtailed what could have been a Hall of Fame career. At age 29, Mattingly first experienced these issues during the 1990 season. His power had been severely cut back with only 14 home runs and 110 RBI’s in 1,074 plate appearances that season and the following one. However, in 1992 he re-discovered his swing, lacing 40 doubles and knocking in 86 runs. Over the next three seasons, which turned out to be the final ones of his career, Mattingly averaged .295 while stroking 79 doubles and winning two Gold Gloves. Wright’s last two seasons have been pretty forgettable, production-wise. He hit only .268 with nine home runs in 586 plate appearances in 2014 and that was when he was healthy. He was first diagnosed with spinal stenosis last May and ended up appearing in only 38 games. However, he did have 12 extra base hits and produced a .379 on-base percentage in 174 plate appearances. These numbers are a far cry from his best years that came in his mid-to-late twenties. As he showed in limited time last year, Wright can still be more than effective. The key for both him and the Mets is giving him the proper amount of time off in order to maximize his output. If he can play 100 games and match his OBP from a year ago, the team would gladly take that. Wright’s $20 million dollar per season contract through 2020 means a trade or an outright release is not going to happen. There are a number of New York fans that hope their captain would take the example of his pal Michael Cuddyer and just retire. That’s not realistic, either. 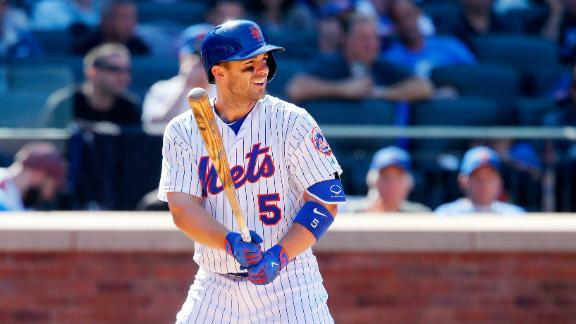 David Wright still offers the Amazins more than just his leadership role. With the right amount of rest, recovery and production, he is more than capable of helping the Mets successfully defend their National League crown. Now or Never for Nate Eovaldi?